An awe-inspiring setup loses its footing in the chaotic avalanche of Everest’s final third. A sprawling ensemble cast sets out to summit Earth’s highest peak, and for the most part, they all do their jobs well. With an impossible amount of star power, it’s only feasible to note the standouts: Robin Wright does more with fewer lines than anyone in the film, John Hawkes inspires us as a mailman-turned-mountaineer, and Jason Clarke (Dawn of the Planet of the Apes) – as the expedition’s leader – gives the first genuinely great performance I’ve seen from him. Michael Kelly, Keira Knightley (The Imitation Game) , Josh Brolin (Inherent Vice), and Jake Gyllenhaal (Southpaw, Nightcrawler) all perform to expectation, but Icelandic actor Ingvar Eggert Sigurðsson blows them all away. He cuts an imposing figure against the mountain, with a classic Bond villain’s charisma. Look to see more from him. The acting doesn’t all land, though. Poor Sam Worthington takes a lot of flack for his grimacing and blinking and jaw-clenching in his other films, but he’ll take it again for this movie – as will the typically wonderful Emily Watson, who putters about with an unfortunate lack of emotion. However, the film looks absolutely great. Striking and beautiful, Mt. Everest’s many faces shine thanks to the work done by director Baltasar Kormákur and cinematographer Salvatore Totino. What the film lacks in dramatic tension or palm-sweating pressure, it makes up with scope and scale. Always referencing the dangerous peak in relationship to the relatively tiny humans attempting to conquer it, Everest never lets us forget the impossible task at hand. Nepalese villages and base camp tents pepper the barren white landscape with colored landmarks of civilization, always contrasting with the snowy wastes surrounding our party of adventurers. Frostbite comes into play late in the film (as one might expect) and the makeup/effect work looks terrific. The decaying horror of this frozen zombification jumpstarts the audience with a grotesque excitement during an otherwise dull finale. The Walking Dead, take notes here. Solid dialogue writing allows realistic conversations and moments to help flesh out characters in the first half when the team gets to know each other. The training montage (acclimatizing montage, whatever) is skillfully done over medical narration about the various ways the human body breaks down under these conditions. Juxtaposing biological descriptions of the danger (your lungs fill up with fluid, blocking oxygen uptake) and the actual facing of the danger (one guy coughs up a bunch of blood) is always interesting. After the initial training, the film’s structure is an absolute jumble. Attempting to follow the expedition’s progress purely chronologically at times, then jumping back and forth between the groups and subgroups that are at various points along the mountain, results in geographic and temporal whiplash. It’s incredibly hard to stay invested in the plight of an individual character when we whirl off to check on five or six others, then fly across the world to check on one’s wife, then back to base camp, maybe a quick look at the weather, and who was freezing to death again? This means no stakes. Sure, we vaguely care about the team climbing to the top and back again. But do we care about the rival group going up at the same time? Or the various individuals that all look the same in their North Face brand parkas and oxygen masks? If I had that hard a time telling them all apart, what chance did I have to care about their goals? 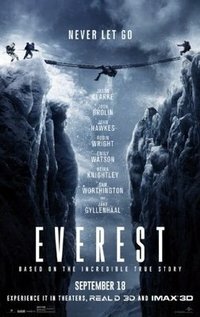 Everest’s glib treatment of its characters’ lives doesn’t help its case, with main characters falling or freezing to their deaths without about as much drama as your neighbor deciding to walk their dog AFTER dinner rather than before. A big reason the characters are interchangeable is their generic chiseled white male actor look. Everyone has a frosty beard, a strong jaw, and symmetric features. The Nepalese Sherpa guides and (at least) two women on the expedition? We don’t really talk about them. Yasuko Namba (played by Naoko Mori), a forty-seven year-old Japanese woman who had already climbed six of the legendary Seven Summits, barely gets three lines of attention in the film. Everest’s finale, chronologically jumping from person to person to person in the climbing party, has about as much dramatic oomph as the ending slideshows in based-on-a-true-story films. Here’s what happened to this guy, Joe Everyman survived his ordeal and now has four kids, etc. Well, it makes a handy argument for an age-old storytelling principle: cause and effect. Jumping from one character’s hubris to five or six unrelated scenes means we lose that payoff. Making us forget about key elements can be useful in mysteries, horror, crime movies, or anything else where you want to maintain a level of uncertainty. But when you suddenly expect an audience to remember and care about the plight of a character we’ve totally forgotten about in the last half-hour, maybe your film could use a bit of clarity. When I sat down for Everest, I didn’t know if I was in for Castaway or 127 Hours. That is, I didn’t know if this was to be purely man vs. nature or man vs. his mind, instigated by nature. Everest tries to split the difference and fails. It also tries to tack on themes of teamwork and togetherness, undermined by the isolation that comes when you find yourself alone in a crowd. It’s hard to establish bonds between humans when your film has the same apathy towards human life as its titular mountain.